4 persons who become my patron will get one free animated chibi! Here comes a new update of my Patreon! So, how it works now? 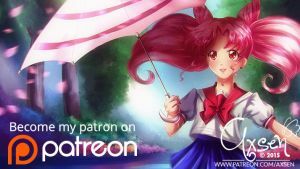 All payments on patreon will be processed first week of each month. And my every 2 weeks I will update the content on my Patreon page. When your payment get processed I will send you your exclusive rewards. Other rewards you can find in the "Creations"/"Activity" section immediately. What you need to become my patron? If you want too to request me a commission please check on info the link below! Very aborable and well done.. So full of color it comes alive! Terrific! What are all those shiny, scary eye things? I love how you did the symbols in the background. This is fantastic! I love Sailor Moon. <<<< Huge nerd. I love how you use the different colors. Loving the colors right now! The colors are so vibrant and bright! I love it! Its very good. The evil eyes in the colors is well hidden until one looks closer giving it an element of surprise. The line up between Sailor Moon and the disk with the symbols is perfect, they flow right into each other. I think I'll favor this, its truly a grand work of art.